The 7th century saw the conversion of Essex (including Thurrock) from Paganism to Christianity, but it took three attempts. At the beginning of the 7th century, London was part of the Kingdom of the East Saxons – the people, not the geographic area. King Saebert converted to Christianity at the behest of his overlord, King Æthelberht of Kent. Saint Mellitus became Bishop of London and his see included Essex. Essex reverted to Paganism on the death of King Saebert and Mellitus was forced to leave. Around AD 655, St Cedd undertook a successful mission to re-convert the East Saxons and built churches at Bradwell and Tilbury. The building of the Tilbury church (on the banks of the Thames) was described in Bede’s History of the English Church and is the earliest written reference to a location in Thurrock. St Cedd became Bishop of the East Saxons, in effect, Bishop of London. He died on 26th October, AD 664. However, on the death of King Sigeberht II (the Good), Essex again reverted to Paganism. West Tilbury church, possibly on the site of St Cedd’s church. The final (and lasting) conversion of the East Saxons to Christianity took place following a mission by Bishop Jaruman of Lichfield sent by King Wulfhere of Mercia, who was overlord of the East Saxons. This entry was posted in Tilbury on October 26, 2017 by rjm. 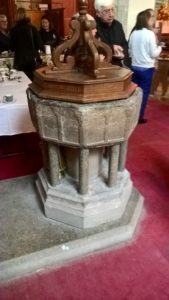 Participants in the Friends of Essex Churches study day on 7th October enjoyed a programme of interesting talks by Dr Christopher Starr and visited a variety of local churches. 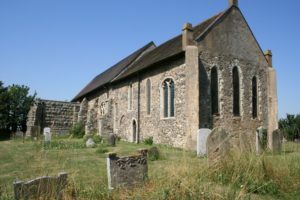 The second of the four churches was St Mary the Virgin, Corringham which has Anglo-Saxon stonework, but currently, a distinctly Anglo-Catholic appearance. The third church was St Peter and St Paul, Horndon on the Hill which was renovated at the end of the 19th century. As a result, it is a delight for enthusiasts of the arts and craft movement. The final visit was to St Mary Magdalene, North Ockendon. The church is rich in heraldry and our own Christopher Harold gave a short presentation about two of the hatchments. The church also illustrates one of the pitfalls for the local historian. Until 50 years ago, North Ockendon was in Essex, but it is now in Greater London. Consequently you will look in vain in the current Essex volume of Pevsner to learn about the church. However, perhaps the most interesting from the point of view of Essex heritage was the first stopping place – St Michael’s, Fobbing. This too has some Anglo-Saxon architectural features on the north wall, including a now blocked window. 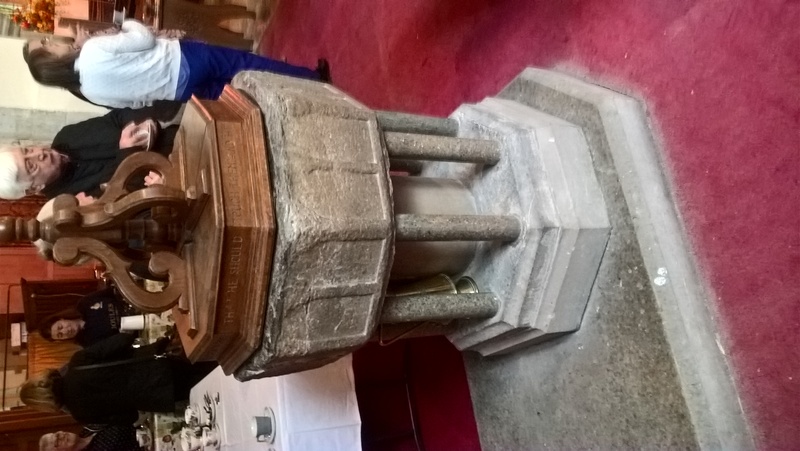 The font is from the 13th century (although the stem and cover are modern). It would have been used to baptise Thomas Baker – one of the leaders of the Peasant’s revolt who was hanged for his participation. He is one of the candidates for a new Thurrock heritage plaque. In the 17th century, the incumbent was John Pell. The Fobbing living was a sinecure intended to finance his mathematical research and he probably spent little time in Thurrock. None the less, he invented the division sign and is undoubtedly the most prominent mathematician to have lived here. He is another worthy candidate for a new heritage plaque. This entry was posted in Corringham, Fobbing, Horndon, Ockendon on October 8, 2017 by rjm.